In celebration of the feature film FIRST MAN, Universal Pictures and RYOT present the FIRST MAN: VIRTUAL REALITY EXPERIENCE, which debuts at select AMC Theatres lobbies -- in the Positron Voyager® chair -- in Los Angeles, San Francisco, New York City and Washington, D.C. In Universal's riveting new drama, FIRST MAN, astronaut Neil Armstrong (Ryan Gosling), commander of NASA's Apollo 11 mission, successfully breaks the bonds of Earth to become the first person to walk on the lunar surface. Audiences will now be able to take that dangerous, thrilling journey in Armstrong's place, from NASA Mission Control, to the cockpit of the Apollo 11 as it breaks through Earth's atmosphere, to the moment the lunar module lands on the moon. RYOT and CreateVR deployed state-of-the-art virtual reality tech to create an experience so real, it's as close as you can get to going to the moon without leaving Earth. •You begin our journey in NASA's Mission Control, where you can explore and see exclusive video of First Man, including interviews with Oscar-winning director Damien Chazelle (La La Land), and stars Ryan Gosling and Claire Foy about the courage and daring of the Apollo 11 mission. •You are then placed in Armstrong's shoes — and in his seat — inside the Apollo 11 Command Module, seconds before launch. The interior of the spacecraft is historically accurate and finely detailed in the placement and appearance of every switch, knob, dial and window. •You feel the immense, barely contained power of the Saturn V rocket as it lifts you out of Earth's orbit and into zero-gravity. •Then, you will arrive at Day 4 of the mission, in lunar orbit, and will begin the descent to the surface of the moon. •You will pilot the Lunar Module, The Eagle, next to fellow astronaut Buzz Aldrin (Corey Stoll), as you experience, firsthand, Armstrong's grit, determination and nerves of steel as you land safely on the lunar surface. Both the Earth and the moon are built to scale, so the veracity and authenticity of the experience is as close to reality as possible. 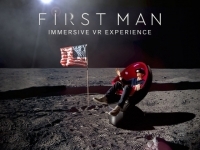 FIRST MAN is the latest cinematic VR theater experience to debut on Voyager®, the world's first full-motion chair designed for cinematic VR, created by technology studio Positron. Voyager® delivers a completely new level of immersion in VR by providing a comfortable, fully integrated personal VR theater that incorporates motorized rotation and pitch motion, haptic feedback, volumetric 6DOF (6 degrees of freedom), interactivity, spatial audio, premium VR headsets, and specialized seating. "The FIRST MAN: VIRTUAL REALITY EXPERIENCE has been specially designed and customized for Voyager®," says Positron CEO Jeffrey Travis. 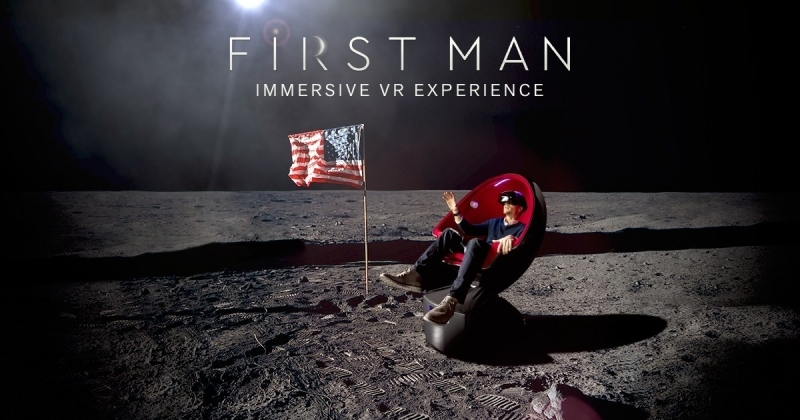 "The unique motion and haptics in the chair, combined with a true volumetric environment, recreates an unmatched, spine-tingling experience of journeying inside the Apollo 11 from take-off to the first lunar landing. In addition, FIRST MAN is the first VR experience for Voyager® that brings 6DOF (6 degrees of freedom) and interactivity to the Voyager® platform. We can't wait for audiences to experience this new level of immersion, and we are proud to partner with Universal on this historic project." For Universal, this VR collaboration was an ideal fit for First Man. "The film First Man is an immersive experience in and of itself, thanks to the first-person POV design by director Damien Chazelle," says Universal Executive Vice President of Creative Content, Austin Barker. "So we're thrilled to have brought together real pioneers in the VR space to collaborate on this experience. This was both a fantastic and obvious opportunity for us. This is as close as most of us will ever get to being an astronaut, if only for a few minutes." In producing the cinematic interactive VR experience, RYOT achieved incredible visual fidelity – leveraging the digitally scanned film in tandem with the full-motion Positron Voyager® chair to create the sensation of sharing a confined capsule with another astronaut. The Los Angeles-based immersive media company has also been behind some of the first-ever VR films for outlets like HuffPost, Associated Press and The New York Times. "RYOT productions consistently place viewers inside an experience that explores the full depth and range of the human journey – and perhaps no journey is more monumental than that of Neil Armstrong's," says Bryn Mooser, CEO and co-founder of RYOT. "We're honored to have played a role in amplifying Damien Chazelle's desire to place audiences in Armstrong's shoes unlike anything that's come before – and the fact that we've been able to simulate a feeling that only a handful of astronauts have experienced just stands as testament to the limitless potential VR storytelling holds for the future of entertainment." AMC Georgetown 14, Washington, D.C.
Friday, October 5 - Sunday, October 14 in LA, San Francisco, Washington, D.C.
On the heels of their six-time Academy Award®-winning smash, La La Land, Oscar®-winning director Damien Chazelle and star Ryan Gosling reteam for Universal Pictures' First Man, the riveting story behind the first manned mission to the moon, focusing on Neil Armstrong and the decade leading to the historic Apollo 11 flight. A visceral and intimate account told from Armstrong's perspective, based on the book by James R. Hansen, the film explores the triumphs and the cost—on Armstrong, his family, his colleagues and the nation itself—of one of the most dangerous missions in history.